Some of the best things in life are free: a lover’s embrace, your child’s giggle, your mother’s comforting hand. But try to find a decent tortilla chip that won’t break the bank! As salt addicts, you’d think we’d hate the No Salt variety; we were pleasantly surprised to discover how tasty the chips were without the added salt! Xochitl chips not only come in organic, non-organic, salted, and no salt varieties, they also come holiday themed! The Christmas ones (red and green) were a hit at the Christmas Eve party. There is also a Halloween version, but unfortunately, we haven’t seen that one on the shelves yet. It is available for order online through the Xochitl store, along with Xochitl brand salsa. There are also flavored versions available online: Picositos con Limon, Garlic, and Cajun. Another bonus? They are Kosher certified. 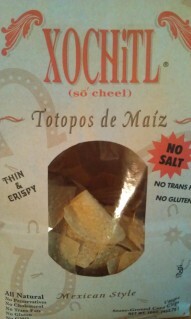 If you’re going to splurge on a snack food, try to Xochitl chips. It’ll be the best $5 you ever paid for a snack! This is an independent review. This blog was not given any consideration in exchange for a review of this product. Obviously, you still can’t eat the entire bag and be healthy, but I definitely don’t feel terrible after having a few handfuls! And since my husband has hypertension, I feel better knowing he’s not getting all that extra salt. I have an American friend who lives here in Melkbos. Guess what she misses the most? Yeah Proper tortilla’s. Not available in this country. $5.00 , imported they would come to about R 120.00 a bag while potato crisps are about R6.00. Not going to happen, we’ll just have to take your word for it. What an original X post! I learned something new today. I will look for these chips, they sound wonderful! How funny, I totally didn’t recognize your “X” word, but when I saw a picture of the bag, I realized I have a bag of their blue corn chips. LOL My husband picked them up last week…now they’re just waiting for me to open them! My name is Lisa and I have a true addiction to the Xochitl no salt corn chips. OMGsh I have never had a stronger longing for any food as I have for these chips! I find myself wanting to eat them for all meals and for snacks whenever I am hungry! Help me understand this weird addiction! I understand you do have a small amount of gmo is this true did you make false claims on your X-chips?